The award-winning New World Trading Company (NWTC) is to release two new ales with a new world twist. Brewed in conjunction with Cloudwater Brew Co. Passionate Blonde is the first to be released, using pale ale malted barley, wheat and ‘new world’ hops: Chinook, Citra and Galaxy from the US and Australia to create a vibrant citrus and tropical fruit flavour and aroma with the prominent taste of passion fruit, hence the name! Following Passionate Blonde is an offering that has been created in conjunction with Freedom Brewery, Pacific Pale Ale is a deep golden amber 4.4% strength ale with a fruity flavour. Brewed using caramalt alongside pilsner malt, with New Zealand hops: Motueka, Pacific Jade and Rakau. Motueka is a versatile hop of the Saaz family used for both kettle additions and in aroma hopping, initially giving citrus lime and lemon flavours with a more subtle tropical fruit in the background, Pacific Jade is a cross bred hop creating a subtle herbal citrus with some crushed black pepper notes and Rakau offers more orchard and tropical fruit flavours especially apricot and passion fruit. Passionate Blonde is available in every NWTC venue across the country as their house beer from 21st April 2015. 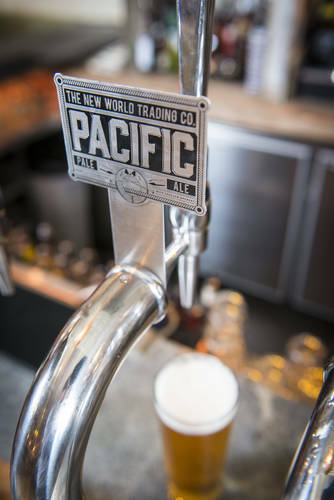 The first brew of Pacific Pale Ale went through on Easter Monday, Freedom will now condition the brew for 6 weeks ready in time for opening of NWTC’s new concept ‘The Trading House’ in London this June.